Probable path of Hurricane Irma as of Sept. 9 at 8pm. The 11 a.m. advisory from the National Hurricane Center puts Jacksonville under a Hurricane Warning. The track continues to shift west, with Irma going up through the west coast of Florida directly impacting Tampa and the Florida Keys. Hurricane Irma continues to impact Cuba as a Category 3 with winds of 125 mph and is forecast to restrengthen to a Category 5 before reaching South Florida. Irma will reach the Florida Keys Sunday morning. Jacksonville is expected to start feeling strong winds from Irma Sunday, with the worst of Irma impact Jacksonville Monday. Mayor Lenny Curry said Irma is “not like Matthew” in a press conference Thursday and urged Jacksonville residents in Zones A and B to start evacuating early if they can. He said mandatory evacuations will likely begin Friday morning. Curry declared a State of Emergency Monday for Duval County. Mandatory Evacuations for Zones A and B began Friday morning. Classes and student activities are canceled Friday Sept. 8 and Monday Sept. 11. Stay tuned for updates. For all things Hurricane Irma, check back hourly. 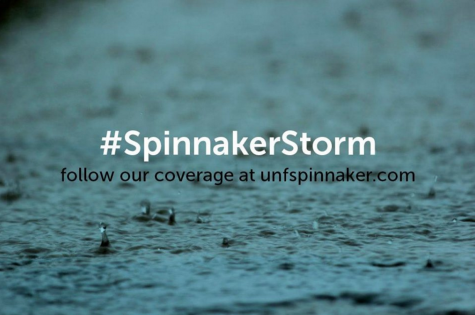 Tweet/Facebook us your photos of how you’re preparing for the possibility of a storm using the hashtag #SpinnakerStorm to be featured on our page.